Unfortunately this years E3 games event has now come to a close but towards the end of last week a new device was unveiled by the start-up company SteamBoy Machine Team in the form of a new handheld console called the Steamboy. The Steamboy console has been specifically created to be powered by Valve’s new SteamOS operating system, which is currently under development by Valve and has been designed to provide gamers with a unique operating system. Check out the Steamboy teaser trailer which was unveiled at this years E3 2014 games conference below. Showing a first look at the new console that will be able to access your Steam library of games and enable you to play them on the just like you would on a Nintendo 3DS or PlayStation Vita console. 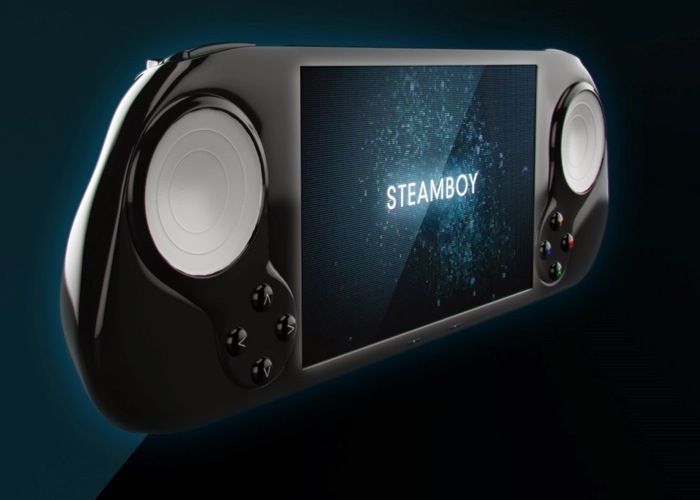 The Steamboy Steam OS powered handheld will be powered by a quad-core processor supported by 4GB of RAM, with 32GB of internal storage as well as wireless and 3G connectivity for users to enjoy. Unfortunately no information on pricing or worldwide availability has been released as yet for the Steamboy Steam OS handheld, but as soon as information comes to light we will keep you updated as always.